A substitution delegate is always welcome with written notification. Cancellations received up to 6 weeks prior to the event will incur a 50% withdrawal fee. For cancellations received within 6 weeks of the event no refund will be issued. 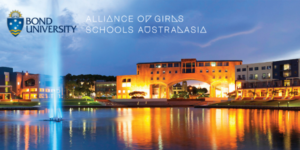 Every effort will be made to contact each attendee should an event be rescheduled or cancelled by the Alliance of Girls’ Schools Australasia for any reason. If an event is rescheduled or not held for any reason, the Alliance’s liability is limited to the registration fee only. Indemnity – Alliance of Girls’ Schools Australasia reserves the right to change the venue and/or speakers of any event due to circumstances beyond its control. In the event of changes to venue or speakers, or cancellation of the event, the Alliance is indemnified against any or all costs, damages, expenses, including legal fees, which are incurred by the attendee/s. In the case of venue change, all reasonable efforts will be made to inform attendees.